This report covers conditions and observations made between Monday, April 30 and Sunday, June 3, 2018. The next scheduled report will be posted on Monday, July 2, 2018. In the event of any significant occurrences prior to that date, this site will be updated as soon as possible. Mild late-spring conditions dominated the Central Valley’s weather during May, providing good support for the developing crop. Daily maximum temperatures were reported predominately in the upper 70’s to upper 80’s during much of the month. However, temperatures increased as the month progressed, reaching into the mid and upper 90’s, with warmest locations rising above the 100-degree mark during the final week of the period. Meanwhile, morning low temperatures ranged from the upper 40’s in the period’s cooler days in the month’s opening days to mid and upper 50’s as the period concluded. While dry conditions dominated, a brief, but relatively vigorous series of thunderstorms delivered locally heavy rain overnight on Friday, May 25th, dropping from trace amounts to as much as a quarter inch of rain in many areas of the valley. 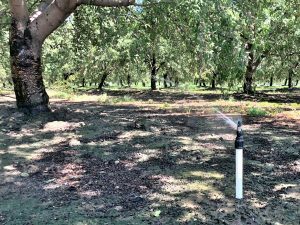 Grower activities throughout the Central Valley were dominated by irrigation, fertilization and decisions on the best course of pest management. 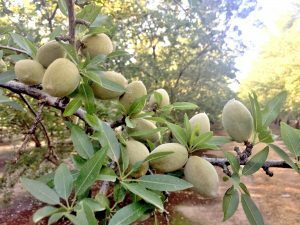 Observers are reporting that orchards throughout the valley are in very good condition with few signs of stress, supported by the mild temperatures. The only difficulty associated with the weather has been winds that have blown nearly every day. Winds on many days ranged from 10 to 15 mph, with the windiest days reaching 20 to 30 mph. In addition to being a bit aggravating, growers in the windiest locations have been frustrated as they worked to complete treatments for Leaf-Footed Plant Bug, Peach Twig Borer and Navel Orange Worm (NOW) in all areas and web-spinning mites in the southern San Joaquin Valley. Growers and their Pest Control Advisors, PCA’s, are very aware of the significant losses imposed in the 2017 crop by NOW and all are making their best efforts to manage populations prior to the 2018 harvest. PCA’s are reporting quite a bit of activity in egg traps, used to monitor egg laying by female moths. Efforts to control populations are generally made at hull split, about one month from now. However, where possible, many also strive to “time” treatments during May, working to complete treatments at the insect’s most susceptible stage of development. 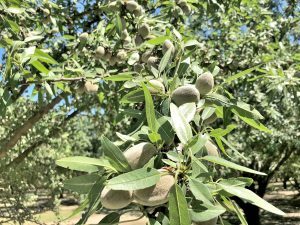 While disease pressure has been quite low, growers in the Sacramento Valley have also been making treatments to combat Rust and Scab, which can defoliate trees later in the growing season. Materials to control these fungal infections are preventative only and must be applied prior to the appearance of the symptoms. As with the other treatments, winds during the month have made these activities a bit more difficult. 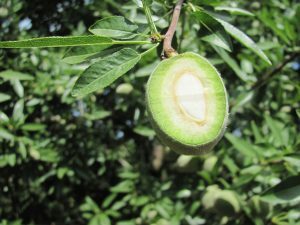 Growers have been mowing vegetation within the orchards and completing fertilizer applications, as the nuts in all areas complete the solidification process and reach their maximum weight. 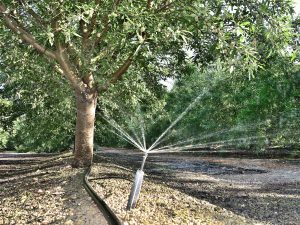 Many growers are able to apply fertilizer materials with their irrigation water, reducing the need to drive machinery in the orchards. Irrigations increased during May and will continue as temperatures rise during the summer. Growers receiving their water from the state and federal water systems have seen slight increases in their allocations. Those serviced by the State Water Project have had their allocations increased from 30% to 35% of contracted amounts, while those south of the San Joaquin-Sacramento River Delta, who receive water from the federal Central Valley Project have had their allocation increased from 40% to 45%. Observers are reporting that orchard removal and preparations to replant are also being conducted. 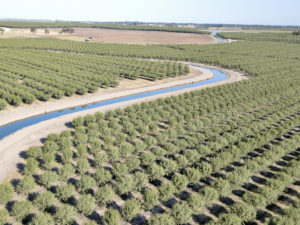 As orchards are removed, the trees are ground into “chips” and either used in co-generation facilities to generate electricity or incorporated into the soil. 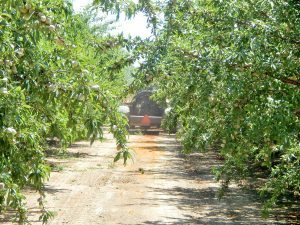 California has experienced a reduction in the number of “co-gen” facilities available to take the biomass from the orchards, forcing growers to consider other options.